Jan 14th, 2016 – Footopia Foot N Fetish Party! Jan 5th, 2016 – Impromptu Footopia Foot N Fetish Party! May. 24th, 2017 Hump Day Extravaganza! May. 20th, 2017 Foot Party! The Girls Next Door! Mar. 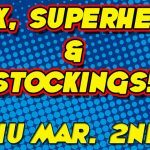 2nd, 2017 Spandex, Superheroines & Stockings Foot Party!